I wasn’t around when Zeppelin played their first gig. I wasn’t around when Sabbath wrote the opening riff that would forever change heavy metal. I wasn’t even a thought in the minds of my parents when a small band from San Francisco decided to play faster and louder than everyone and, subsequently, invented thrash metal (looking at you, Metallica). My point is, I never really had that “moment” where I discovered a band, still in their early years, and knew instantly that they were something special. That is, not until this year. This year, I saw a band out of Texas called Nothing More. And this band, cliché be damned, changed my life. But we aren’t here to talk about their live performance. We are here to talk about their album from this year. For this album to get to #1 on my list, it has to be something special. It beat out Scott Stapp. It beat out Alter Bridge. Hell, it beat out every album I bought this year. Why? The self titled sophomore album from Nothing More is nothing short of a musical masterpiece. It is crafted in such a way that makes it feel like a concept album without having a blatant story line. It is a theatrical work of art that is distinctly divided into two acts. This album progresses through the extremes of many different human emotions, yet it does so in a way that is genuine, powerful, and deeply moving. This album is angry. This album is remorseful. This album is hopeful. This album is damn good. For me, this album revolves around a central that is comprised of three songs (if you want to be technical, they are more towards the latter half of the album, but I digress): “I’ll Be OK”, “Here’s To The Heartache”, and “If I Were”. This album deals heavily with loss. Being a psychology major, it’s very exciting to see loss dealt with in so many different ways. These three songs face loss from different perspectives. However, while these three songs are phenomenal (“If I Were” is a personal favorite of mine for reasons unbeknownst to most), they are but building blocks to, what I feel is, the climax of the album, which is the track “God Went North”. At this point on the album, at track #16, you would think that the band is running on fumes. 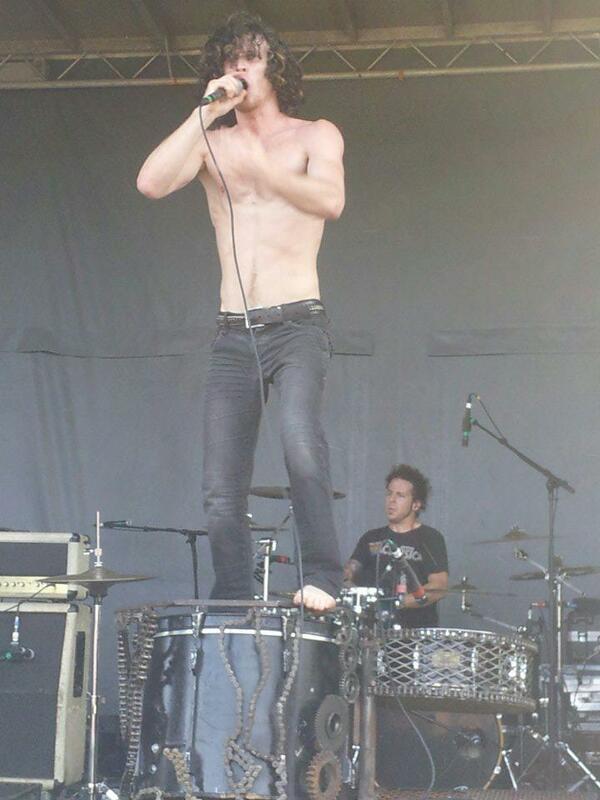 You would think that vocalist Jonny Hawkins has given his best performance. But the entire band shines on this track, especially Hawkins. I had the privilege of talking with Jonny at the last show I went to. This band lives for this music. Jonny was cool enough to listen to my story and how much this album impacted me. If you listen to this album from front to back, you can tell that this album deals with a lot of personal and emotional demons of the band members. I’ll say the same thing here as what I said to Jonny that night: I’m not sure what the band had to go through in order to get this record made. But whatever it was, you guys made it out the other side and created a masterpiece. In today’s music landscape, it is rare to find a band that is so honest, so powerful, and so unrelentingly progressive with their music. If it were 10-15 years earlier, this band would be on top of the world. They have the music to prove it. You owe it to yourself to give these guys a listen. It may be a while before a band as good as these guys comes around again. When they launch into the stratosphere of music history, this album will be seen as a landmark accomplishment for the band. And for me, personally, this album got me through one of the darkest periods of my life. 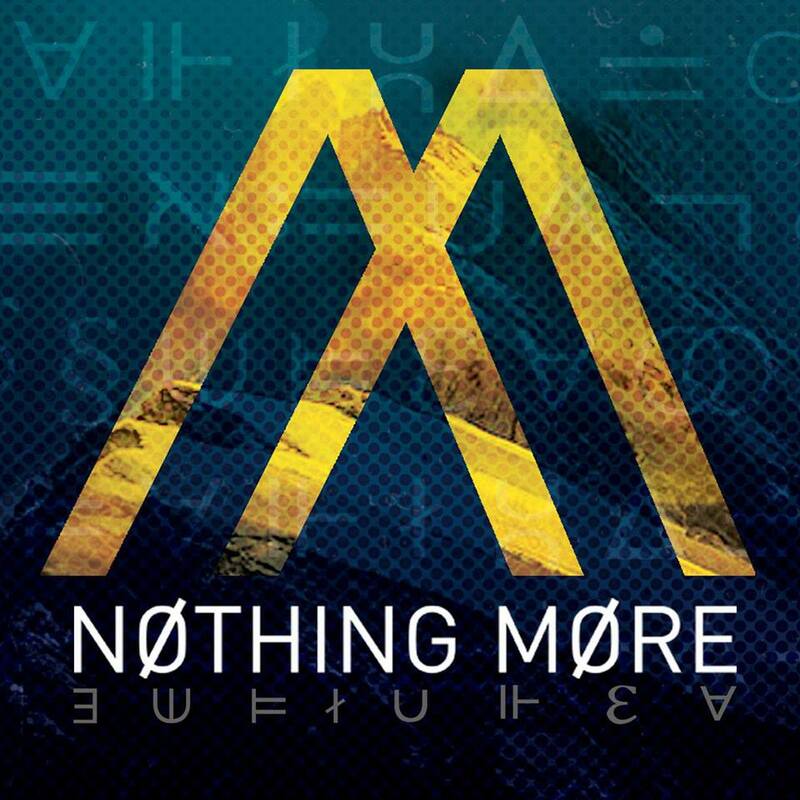 And for that, among so many other reasons, I am honored to say that the self-titled album by Nothing More is my #1 album of 2013. I had the pleasure of chatting with West Brook of the Ivey-West Band recently, and the philosophy of the above quote was a constant thread woven throughout our conversation. You get the sense that music isn’t what they do, it’s who they are. The Ivey-West Band came about approximately a year ago with the partnering of Paul Ivey and West Brook. 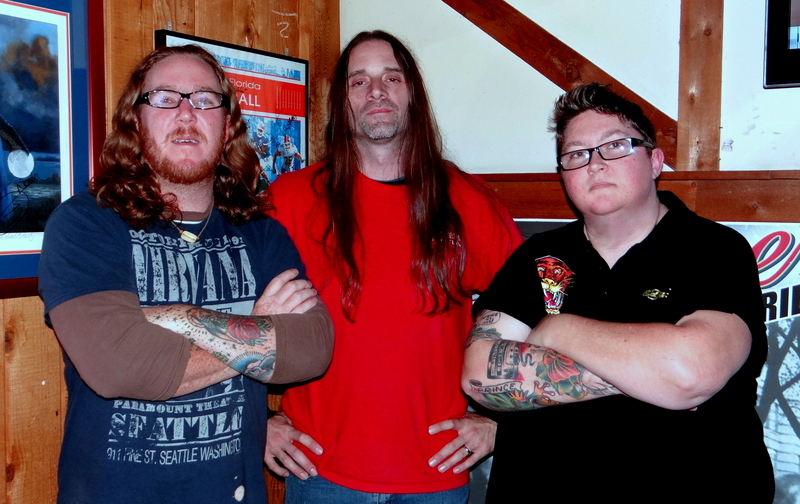 The band members are all career musicians from varying genre backgrounds. Melding styles spanning from Blues to Funk to Southern Swamp Rock, this unique, southern roots band – with an urge to jam – is guaranteed to please! 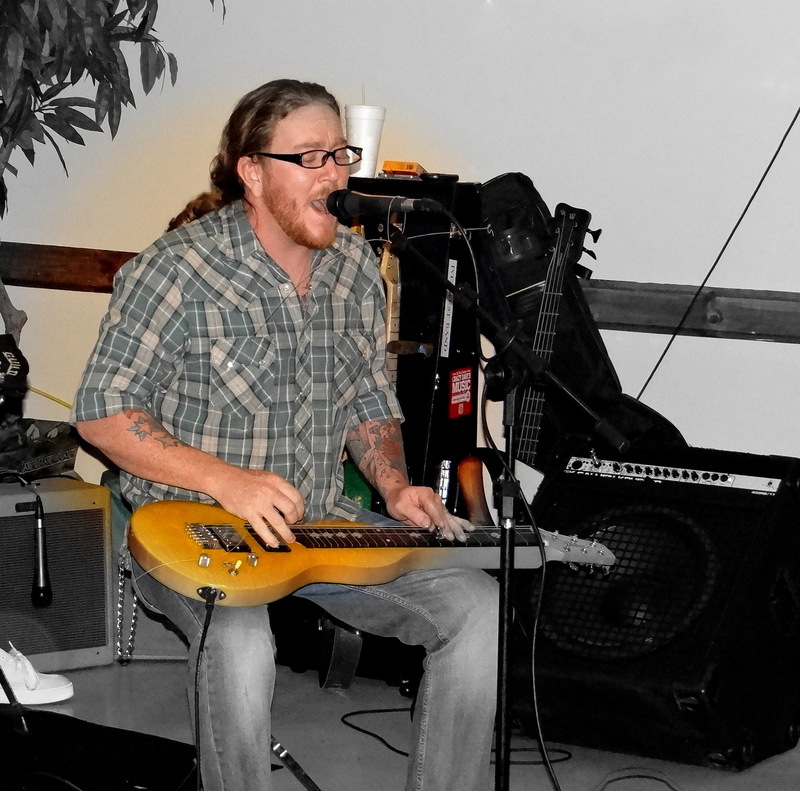 Veteran guitarist and vocalist Paul Ivey is from Jacksonville, Florida with over 20 years experience playing guitar in various styles. Coming from a musical family, he has been singing since childhood and began playing the guitar at age 14. With influences from the Allman Brothers Band and Lynyrd Skynrd, Willie Nelson and Johnny Cash, his style can be described as classical Southern Rock. He has toured with the Yankee Slickers and opened for numerous national acts. 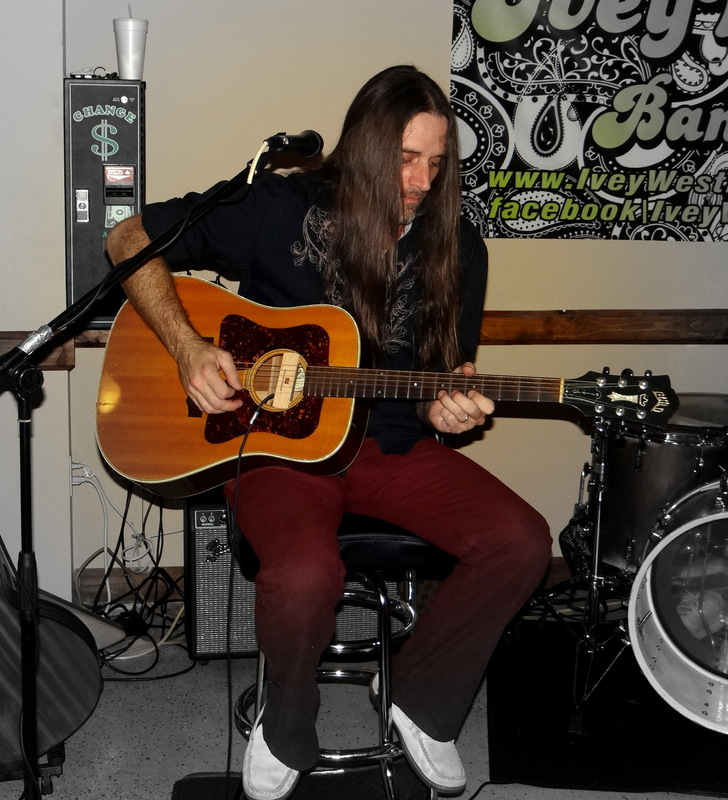 Guitarist and vocalist West Brook hails from the Tampa Bay area of Florida. 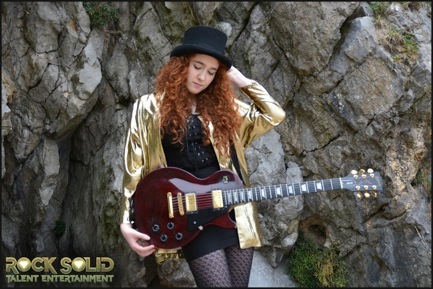 Starting at age 13, West has mastered numerous instruments including the electric and acoustic guitar, mandolin, lap steel, bass guitar, piano, harmonica and others. 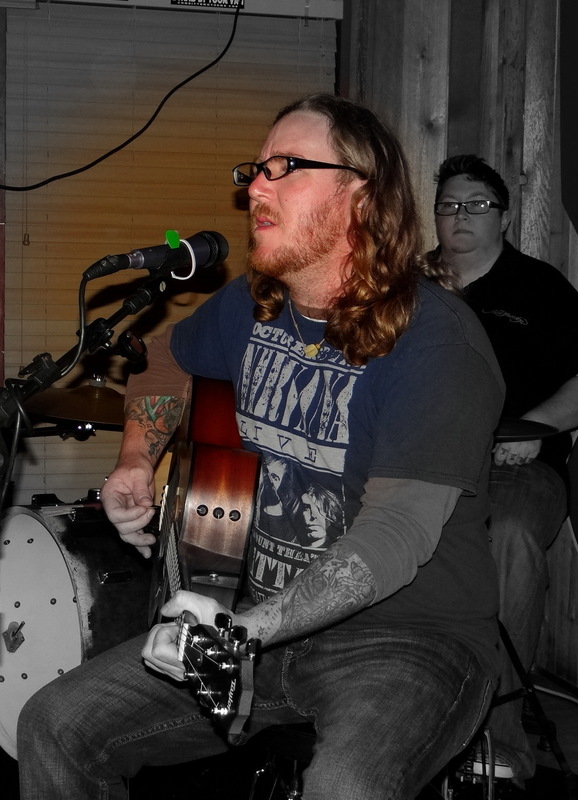 Having played in bands covering genres from Blues to Country, his influences are artists such as Albert Collin, Johnny Winter, Bob Dylan and The Band. These influences are the basis for West’s playing what he calls “Rockin’ Roots Music”. West has also performed on stage with national recording artists and played lead guitar for New Orleans recording artist C.P. Love’s, The White Rice Band. On drums you will find “The Pocket Master”, “B. B. Queen” or “Shark Foot”, – Jacksonville’s Bea Gayle. Having played for the past 20 years, “Music is my life” says Bea, “it is the ONLY thing that has ever gotten me through all of my hardships”. Influences from country, bluegrass and b-bop produced what she refers to as her “organic, solid, yet versatile style”. With influences spanning Louie Armstrong, Waylon Jennings, and James Brown to Radio Head, Cold Play, and Fleetwood Mac, we can understand how her versatility makes her a very adaptable, in-demand, all purpose drummer. 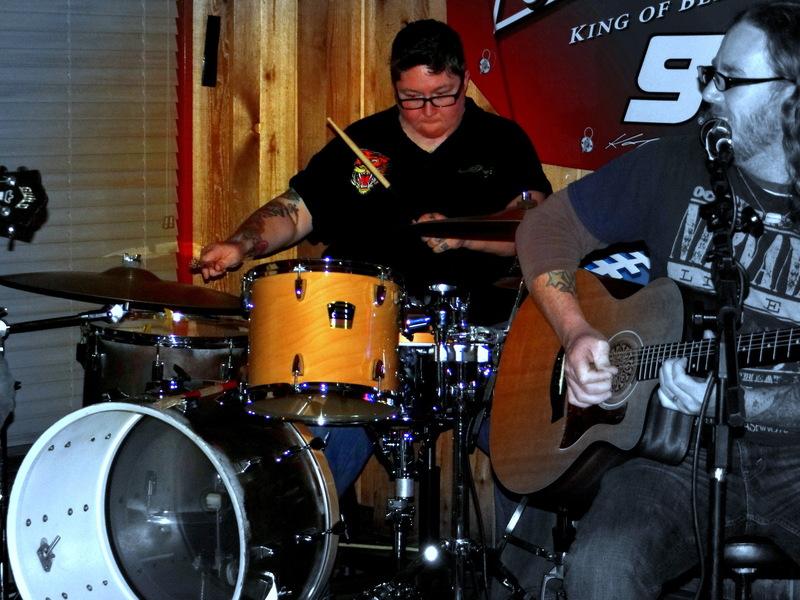 In addition to performing as a three-piece band, Paul and West perform as the Ivey-West Acoustic Duo also, again demonstrating their versatility as artists. 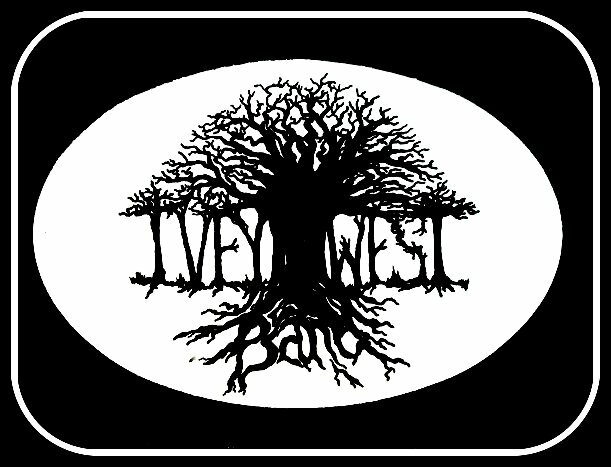 With this amount of talent and experience, combined with their dedication to their music, we can see that the Ivey-West Band has just scratched the surface of its potential. Coming from musical families, they are focused on building a legacy for their own families. Admirably, with high values and work ethics, they are focused on their own careers, yet they are supportive and encouraging to their fellow musicians. 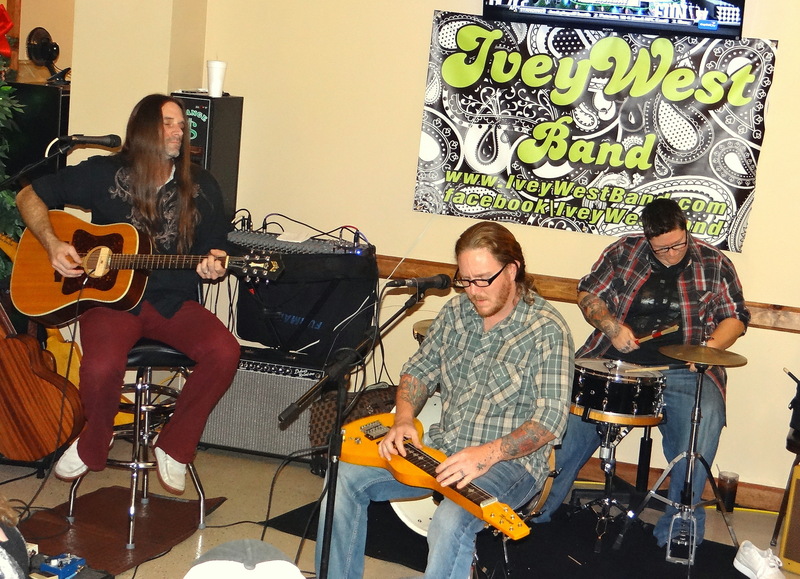 The latest Ivey-West Band news is the release of their first CD titled: “LIVE FROM THE SWAMP”. You’ll quickly find yourself attached to Ivey’s funky, blues, groove oriented sounds and West Brook’s earthy, Joe Cocker style voice. This is truly a collection of fun, sensitive and addictive songs. Their CD is available at all their shows in the NE Florida and S Georgia area. 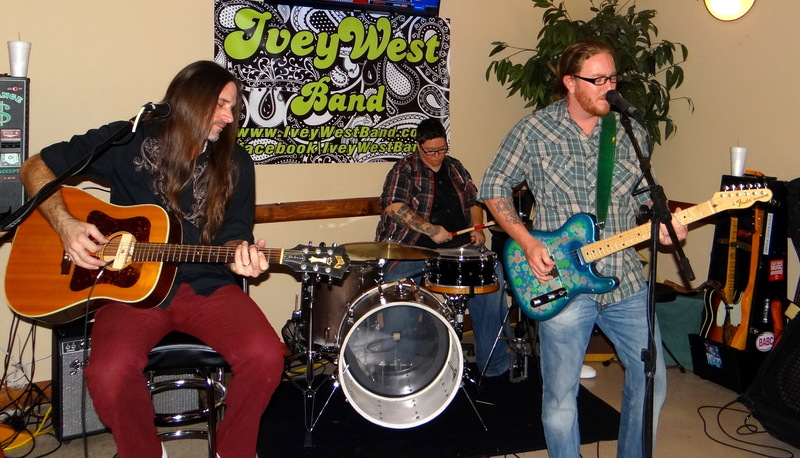 A list of their current gigs from now through May 2014 is posted on their website: http://www.iveywestband.com. Become friends on the Ivey-West Band Facebook page. You can also contact them by email at: iveywestband@gmail.com. Enlighten yourself – Check out the Ivey-West Band! “Just do what you love to do and be true to yourself, because that’s what will make you the happiest. In order to be successful, you have to have a strong work ethic. Exceptionally good advice you’re thinking, and wise words of wisdom from a person who has probably lived long and experienced the highs and lows in the winding road to success. However, these are the words of a very talented and successful singer, songwriter, and actress named Sophia Radisch, who is wise beyond her fifteen years and rapidly establishing her claim to fame. SRO: The information I have read about you states that you started at age 13. What was the catalyst to your songwriting/singing? Sophia: Yes! I started at age 13, and what sparked my interest for music was attending an acting for the camera class in Ottawa, Canada, my hometown. Our coach asked us to do a self portrait, which is an exercise used to express ourselves in front of the classroom artistically. I got inspired by a quote on the wall and wrote my first song “Love is the music of my soul”. I haven’t stopped writing since. I have a great love for writing music and lyrics, recording and performing live too. SRO: How did you go from singing to acting? Through the same agency representing your singing career? Sophia: My work in music and my work in film are two separate careers; my two biggest passions. 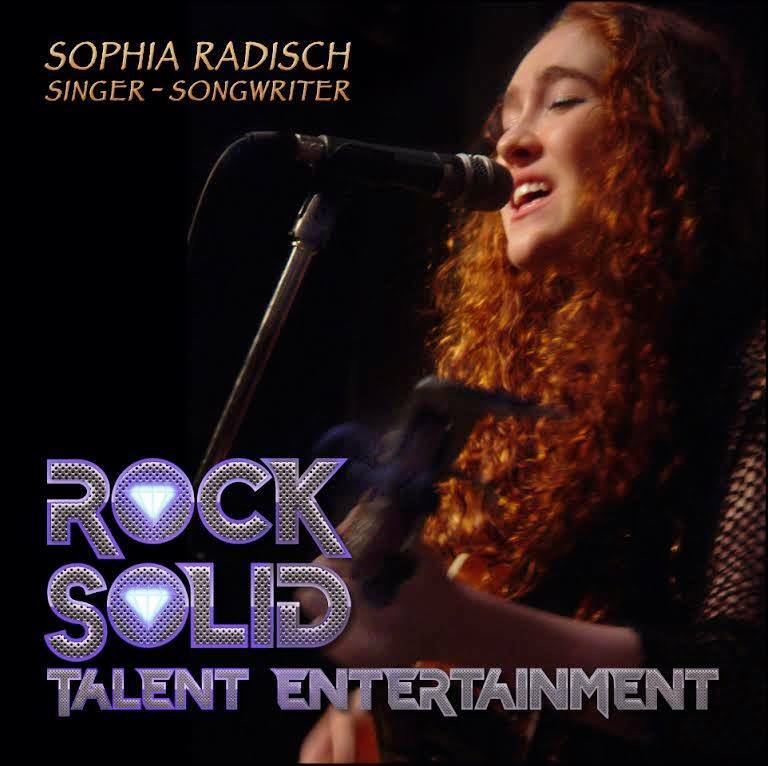 I’m being represented by Rock Solid Talent Entertainment. SRO: How do you arrange your schedule around school? Sophia: I’m fortunate to be an only child and home schooled by my road manager/mother. She travels with me at all times. SRO: Are other members of your family musicians or in the music industry? Sophia: I’m very fortunate to come from an artistic family. My father is a visual artist and musician. Also, my mother is a former drama teacher. I grew up in a home where creativity was respected, supported and nurtured. This wonderful combination of talent, focus and a supportive family are working exceptionally well for Sophia. She has composed 90 songs to date. Her music has been shared on internet radio and radio airwaves in many countries including Canada, the USA, and the UK. She has three professional song-writing collaborations with Music Hall of Fame song-writer, publisher, music journalist & producer Larry Wayne Clark. Currently she is taking guitar sessions from Glen Drover, former lead guitarist for Megadeth, who will be playing lead guitar on her upcoming two (yes, two) new albums. She is currently in the UK in the process of recording these albums. Her original composition “I Can” was accepted into the Ottawa International Music Video Competition on August 19, 2012. Sophia plays the lead character “Lilly” in the feature film “Thirteen Downs” which premiered and opened the @ The Ottawa International Film Festival, August 16, 2012. Her original composition “Rain” was used in the film, as she performed her original song in character. She was cast as lead in Short Films/Commercial Productions PSA “The Helping Hands”. And this past April, Sophia won the “Rising Star Award” at the 2013 Wire Awards held at the Market Hall Performing Arts Centre in Peterborough, Ontario. On Sunday, November 17th the planets will align and the Gods of Rock will be smiling down upon The Rock Shop in Fayetteville, North Carolina as Standing Room Only Magazine presents the Battle of the Bands-, $1000 Winner Takes All Music Fest! Ten bands fighting for $1000; it is going to be an EPIC event you don’t want to miss. Doors open at 6pm, show starts at 7pm. Each band is selling pre-sale tickets for $7. You can also call or text 910-229-8524 for tickets. Tickets at the door are $10. There will be a 50/50 drawing and a raffle for a new Squire HS Bullet Telecaster. Tickets are $1 each, 7 for $5, 15 for $10, and 30 for $20. SRO Mag will be there, with a photographer on site and Stanley Eisen will be covering this amazing event with an article about the BOTB and featuring the winning act. Have you ever met someone and immediately sensed there was something special about them, a quality that you knew made them great? Last night I did, and she comes in a tiny package by the name of Nikol! 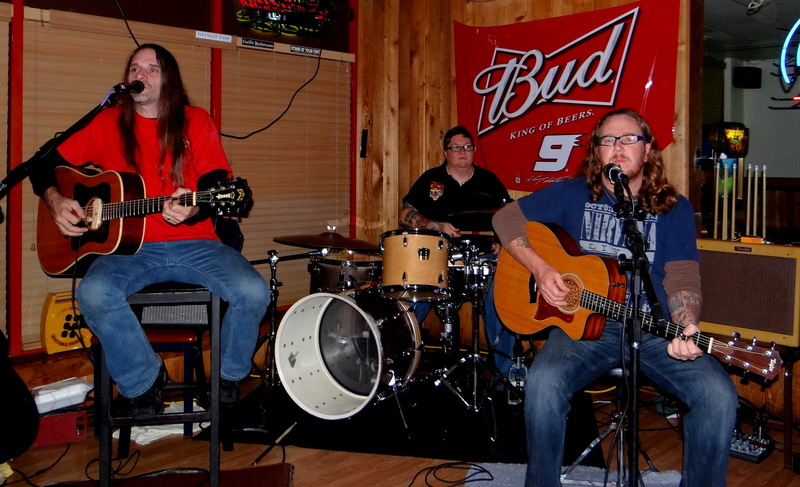 Recently, she played an acoustic performance at The Drunk Horse Pub, in Fayetteville, North Carolina for SRO Magazine Presents ‘ROCK THE VILLE’. I had the distinct pleasure to sit down and talk with this talented young lady and find out a little more about her. Nikol was born in Lexington, Massachusetts but today she calls Wake Forest, North Carolina home. She has played guitar for about six years but performed all her life. In school she was in every singing group available to her (girl’s ensemble, chorale, chorus, etc.) and she played the violin for four years. Nikol bought her first guitar (a black thin-body Martin acoustic/electric) right after she turned 18 and started taking lessons at the Raleigh Music Academy. I asked Nikol what lit the fire for her to pursue a musical career. She actually gave me the date of May 18, 2001 specifically; it was a Christian concert featuring Rebecca St. James. That event hooked her. Nikol has opened up for a few fashion shows and has played shows at live music venues in Virginia and various cities in North Carolina. She also performed at The Berkeley School of Music in Boston, Massachusetts while attending a stage performance workshop. Nikol released her debut CD with the Tate Music Group, entitled Bittersweet on July 30, 2013 and it is available on iTunes and Amazon. Bittersweet is a well written and produced collection of music that definitely is a must listen! It has an Avril Lavigne feel to it. Nikol’s vocal ability is displayed to perfection in every song and the musicians that perform on the CD with her are a complimented by her unique talent. Asking her to describe the CD she replied, “It is edgy pop rock. I hate to say the word “pop” because everyone thinks Katie Perry. The song Goin’ Down is the first single released from Bittersweet. Nikol aspires to make music a career and is gearing up with a brand new band to take the music scene head-on! She hopes someday to perform with violinist Lindsey Stirling, Imagine Dragons, and Yellow Card. Once her music is exposed to the masses, I think she will have her choice of artists and bands that line up to collaborate with her. For a chance to see her next performance, Nikol will be appearing on November 19, 2013 at The Black Flower in Raleigh, North Carolina. This will be her first show with her new band. We highly recommend you check out her show. We are asking all our readers and their friends to help us reach 1000 subscribers on our YouTube channel. Thank you for the Love, Respect and Support you have given us in the past five months; it has been inspirational to say the least. I hope that we can continue to gain your favor in the months and years ahead. Additionally, I encourage you to give us a like on the SRO Fan Page. I’m a pretty straight forward person. There are times when I shoot my mouth off before I think, but all in all I have a pretty good bead on situations and I tend to have a great sense of people and what makes them tick. I don’t generally bite my tongue when it comes to something that I am passionate about and this includes, but is most certainly not limited to music, films, and photography. I grew up in a family that thoroughly enjoys music. My father played guitar and my mother sang and played piano. They would entertain their friends with Tammy Wynette and George Jones or Conway Twitty and Loretta Lynn renditions. My father even tried to teach me how to play the guitar when I was a small child. I was encouraged to try out for the school band, which I did and played the clarinet in the 5th grade and the saxophone in the 6th grade. You can say music is in my soul. I even married a musician if that tells you how much I really love music. Photography is a passion of mine. I cannot tell you how much I love to look at the photos taken by others or those I take myself. To see life as it unfolds in photographs is an amazing ride unlike any other. I prefer to tell a story with the pictures I take. There are no words but the images leap off the paper and into your mind and you can put your own story down as you see it. That is why I will always love the still picture. Music, as I said is in my soul. I will listen to a variety of musicians and styles. I find that each original song or even if it is a cover tune, has the ability to touch ones spirit and lift it in the direction that life was meant to be traveled in. From hard rock to swing music, you just cannot beat the way music will make one feel at any given moment. Live music, in my not-so-humble opinion, is the best. You are there, in the flesh, living in the moment. It takes one’s breath away. Who knows what the future holds? I certainly don’t. But I can tell you I hope life keeps giving us music and great shots to take. Here’s to seeing you on the road of life!